Pocket watches were mentioned in a post in another sub-forum here and got me thinking about some I have accumulated over the years. I never actively collected pocket watches, but I'm a sucker for old world time pieces. There are two small drawers for pocket watches and mechanical stop watches, but the left drawer has the ones that run (either serviced by someone or CLA'd by myself). 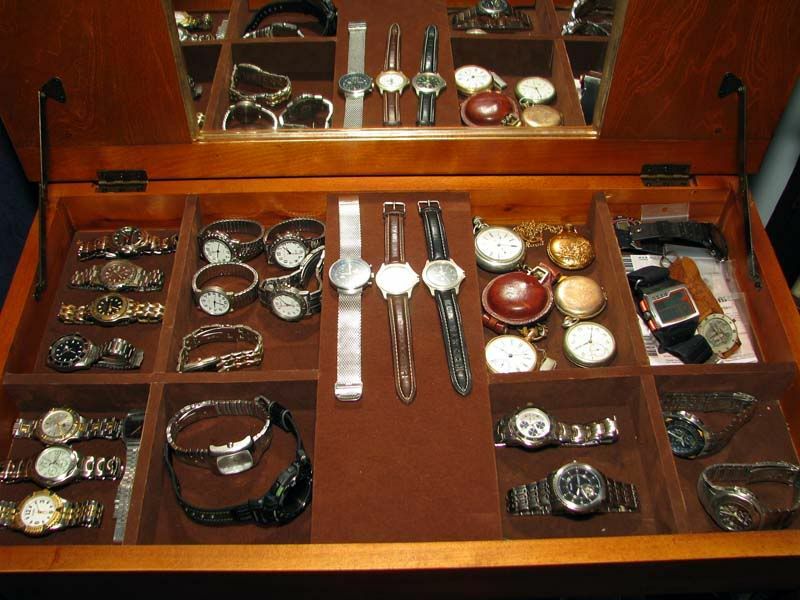 The right drawer has the mechanical stop watches and non-running pocket watches(mechanical or battery). While I have 30 vintage wrist watches, the pocket watches are much more elegant. Anyone else want to share their pocket watches/collection? I pulled out my 7 favorites. One of the 1860s/1870s Silverloid Hunter Cased watches has a replacemend "Swiss Bar" movement and unmarked dial. Still cool though. The Bristol(w/ Dayton movement) Silverloid 1860s watch is a good runner though. The 18k gold Hunter case is the one I carry in my suit jacket pocket(made between 1910 & 1920). I have a few pocket watches...mostly inherited from family members. I have only one pocket watch that was passed down. But, it was my Grandfather's "beater watch". Worn while gardening and such. It's a pocket Ben. I don't know what happened to his dress watch though. I do have memories of him using the Pocket Ben, so that is cool. Here is an old 2009 photo showing the few pocket-watches that I currently have. The three on the left(mid section below leather bound watch) look like antique pocket watches. 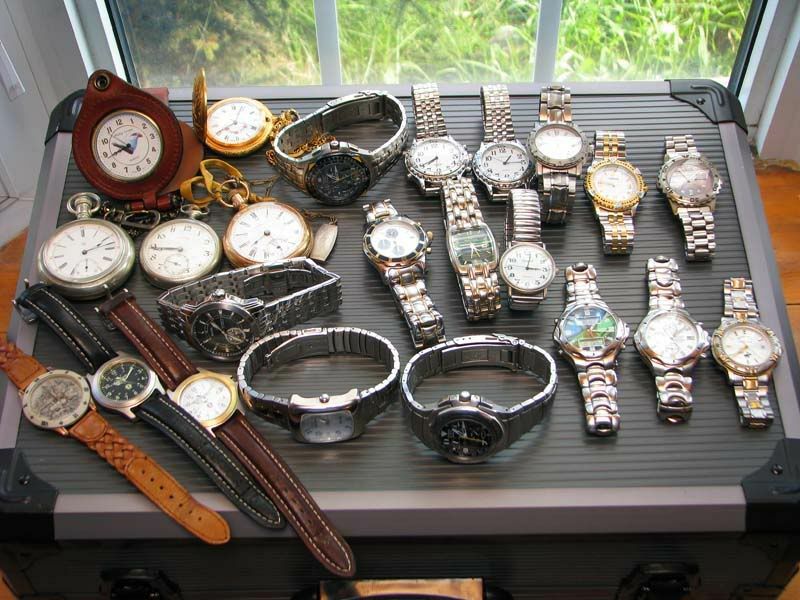 I am guessing the far left one is a silverloid case watch from the 1860/1870s? I like the gold one that is third from the left on the same column as well. Looks to be later 1800s as well. Very nice. You have a good eye. The leather covered one dates to the late 80's when I was in High School. I did have another, like that one chako has in the corner in the leather case but I think it got lost. But this one my father-in-law gave me before I married the Mrs.. good ol Wall-e keeps an eye on it for me.. The late 80s were a rare time to see a pocket watch(an analog dial anyway), so that is cool you have one! Nice display you have going on for your pocket watch! I have seen one of those Harley watches before, but it didn't have the stand or case with it. If I recall correctly, it is quite heavy for a pocket watch. The detail of the watch case is nice as well. Here is a newer photo. I had to dig through all my photos to find it. Heavy hah, that things a tank! But thank you, it’s really the only thing I have from the father in law, besides a knife that I found while working with him. It’s not really something you would actully use, it’s more for a display, thus the stand! Very nice display for your watch collection, Chako! It is amazing how much, just having stuff arranged well, makes it look so much better ! I know you know this, but just in case, make sure there isn't an old battery in there. I can't even count the number of times I have purchased an older battery watch and the old battery has leaked and destroyed the drive train in the movement. And I won't even get started on buying old mechanical watches people have sprayed wd40 on the movement. It turns into a green goo that makes it almost impossible to clean. Indeed. It likely will have a basic non-jeweled (precious stones used as pivots to ensure longevity) quartz movement, most likely using a 377 battery. On the plus side, those quartz movements generally last a long time with regular battery changes. The antique pocket watches have gorgeous movements for a big reason. Back in the hay-day of pocket watch antiquity, the buyer would enter the watchmaker's shop and choose a watch case and then choose a movement. Movements were ornate and nicely detailed to attract the buyer to pick that movement. Some antique mechanical pocket watch movements are so detailed and intricate, they demand thousands of dollars. Pocket watches are already a thing of a past heck wrist watches are starting to become a thing of the past because of phones, especially analog, I don’t think our younger kid can even read them, heck they are changing all school clocks to digital! I’m kinda getting bored of my two digital watches, I just love them cause they don’t need batteries cause there solar, yet my one is also atomic, so just set it and forget it. But I’ve had my eye on a citizen which is analog, all numbers, day, date, and also solar, so only work is keeping the date up to par.. I know what you mean. Someone asked me the time a few weeks ago and I turned my wrist so they could see my watch's dial. They looked bewildered. I have worn an analog watch on my wrist for over 20 years and cannot understand why anyone would want to manipulate and wiggle their phone out of ther pocket to see the time. You risk dropping and breakingyour cell phone just to check the time. Digital is fine, but I do think people need to be able to read a traditional clockface. It is particularly important for military applications. And even I use the "Of the Clock"(O' Clock) directions to let people know where to look in relation to where they are at. A number of tests have shown that reading an analog dial showing minutes and hours is much faster than reading a digital time display. The brain processes the singular image showing hands positions faster than it serially processes the individual digits. The positions of the hours around a 12-hour dial are every 30 degrees. Military still uses it for giving approximated directions relative to a specific one, such as current heading. It's hard for me to imagine, as we are surrounded by analog clock dials, that someone older than about 6 or 7 would be analog dial illiterate. The actual watches in the current US military inventory, even though they're never issued to anyone, are all analog dial. AFAIK they're currently made by Marathon in Canada and have been for over 20 years now. Learning to read an analog should be a no if’s. Now learning to understand someone when they say like 1/4 to 4 rather then 3:45, ahh, cause the little guy asked me what time it was the other day and that’s what I said and he was like huh? Yet at the same time there no longer doing cursive, I forget where we were but one of his friends got I think a bday card and someone wrote something on the card and he had to hand it over to have it read.. In my recent wrist watch acquisition, there was an anomaly in the bunch. A Victorinox Pocket Watch. The glass has scratches, so it won't be a shelf queen. It is also kind of ugly for a pocket watch (call me old fashioned about watches, but this Vic pocket watch is too "practical"). So, for the pic, I threw in something pretty. It will likely end up in my camping bag. I wear a pocket watch every day (in my trousers pocket with the chain attached to a belt loop) apart from if I'm in a suit. I don't like a watch on my wrist getting in the way of doing stuff with my hands (i.e. when I'm not wearing a suit ). I also don't like seeing the time constantly. I want to choose when time is controlling my life. That's what the watch pocket is for in your jeans I don't wear jeans but I keep it in the pocket with my little wallet and my phone. Non scratchy stuff. Yeah, I got into the whole EDC world specifically to organise and slim down my carry. I'm happy that it's worked. I carry more stuff but far better if that makes sense? Far more comfortably. I have a few of those but never wear them. One has some 100 years, was my great grandfather. I have a couple of quartz replicas that are too light/innacurate to use. I just use them as decoration. Very nice! That Gotham is quite handsome. And that grail watch. I don't wear a pocket watch often, but really enjoy it when I do. It is one of those things other people like, but don't often carry(or own) themselves. It makes total sense. My problem is that I find ways of EDCing more and more. So no matter how good my EDC carry methods get all the available space gets filled anyway(does that mean my edc is in a gaseous state? ). Maybe it will get better when and if I actually manage to grow up.